2019-20 will be Frank Colabufo’s 32nd season coaching high school hockey and his 26th season as the head coach of the West Genesee Wildcats. His career record is 427-152-40. His teams have won 12 League titles, 11 Section III Championships, appeared in the Final Four seven times, and played in five New York State Championship games, winning the title in 2010 and 2001. He earned Coach of the Year honors in 2019, 2018, 2012, 2010, 2007 and 2002. He was inducted into the Town of Camillus/West Genesee Sports Hall of Fame in 2017. The former Wildcats player joined the coaching staff in the 1991-92 season as an assistant coach, under Hall of Fame Coach, Dr. Royden Fitzgerald. He was an assistant coach under Mike Major at Liverpool High School from 1988-1991. Colabufo holds USA Hockey Level 5 coaching certification and has been a USA Hockey CEP instructor. He is the Director of the West Genesee Summer Hockey Camp at Shove Park. He has served on the Empire State Games Central Region selection committee and was a part of the Central team coaching staff in 2002, 2003, and 2004. Colabufo is a special education teacher at West Genesee High School. He has a Masters Degree in Special Education from Syracuse University and a Bachelor of Arts Degree from Le Moyne College where he majored in English. Frank and his wife, Ann, have five children, Nathan, Meghan, Sammy, Daniel, and Julia. 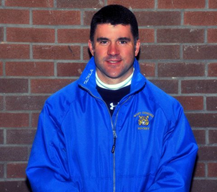 Scott McDonald begins his 19th season as an assistant coach with the West Genesee Wildcats. During his tenure, the Wildcats have won league, sectional, regional, and state titles. The former Wildcats team captain, played at West Genesee from 1981-1984 where he led the team in scoring in his senior season. He played on the Central Team in the Empire State Games and was chosen to play in USA Hockey’s Select 16 Camp in Lake Placid. McDonald went on to play at Elmira College where his teams won ECAC West League and Playoff Championships. In 1988, as a senior, he played in the NCAA National Championship game. Following his collegiate career, McDonald earned an NHL tryout with the New York Rangers. McDonald holds USA Hockey Level 5 coaching certification and has been a USA Hockey CEP instructor. He is an instructor at the West Genesee Wildcats Summer Hockey Camp at Shove Park. His loyalty and commitment to the hockey program has been previously recognized, as he is a past recipient of the Sam Alfieri Award. McDonald has a Bachelor of Arts Degree from Elmira College where he majored in Economics. Scott, his wife Kathy, three children Ryan, Matthew, and Patrick. Dan Alfieri begins his 18th season as an assistant coach with the West Genesee Wildcats. During his tenure, the Wildcats have won league, sectional, regional, and state titles. Alfieri holds USA Hockey Level 5 coaching certification. He is an instructor at the West Genesee Wildcats Summer Hockey Camp at Shove Park and is the Head Coach of the Camillus U-14 team. His loyalty and commitment to the hockey program has been previously recognized, as he is a past recipient of the Sam Alfieri Award. Dan and his wife, Gretchen, have three children Joe, Tom and Emily. 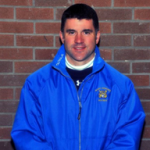 Sean Coakley has been an assistant coach with the West Genesee Wildcats since the 2008-09 season. His primary responsibility is coaching the goaltenders. Coakley comes to West Genesee from Morrisville State College where he served as assistant coach of the Mustangs during the 2007-2008 season. He spent the previous four seasons at the Cardigan Mountain School in Caanan, New Hampshire where he was a biology teacher while serving as head hockey coach. Coakley spent the 2002-2003 season as an assistant hockey coach with Ohio University where he earned his master’s degree in coaching education. Prior to joining the staff at Ohio University, he served as a goalie coach for the St. Lawrence University men’s ice hockey program. 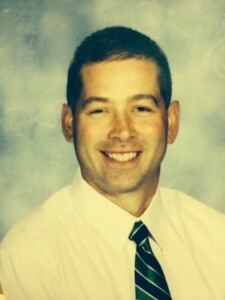 Coakley played goaltender for St. Lawrence University from 1997-2000, earning his Bachelor of Science degree in Sport and Leisure Studies with a Minor in Education. During that time, St. Lawrence won two ECAC championships and appeared in the 2000 Frozen Four. Coakley works as Program Director for Special Olympics. Sean his wife, Kerrie, have two children, Jack and Brynn. Bob Shattell has been an assistant coach with the Wildcats since the 2010-11 season. Shattell comes to West Genesee from Liverpool High School where he served as an assistant coach for the Warriors. He played hockey at Liverpool High School and Le Moyne College where he earned a Bachelor of Arts Degree. He is a special education teacher at OCM BOCES. 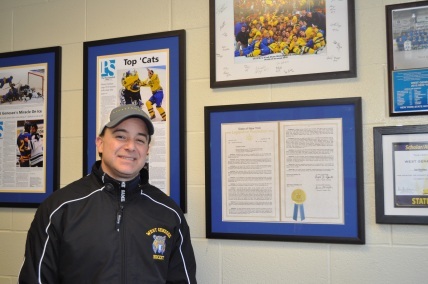 Shattell is the owner of Salt City Prospects, and is the Head Coach of the Syracuse Nationals U-18 team. He is an instructor at the West Genesee Wildcats Summer Hockey Camp at Shove Park. 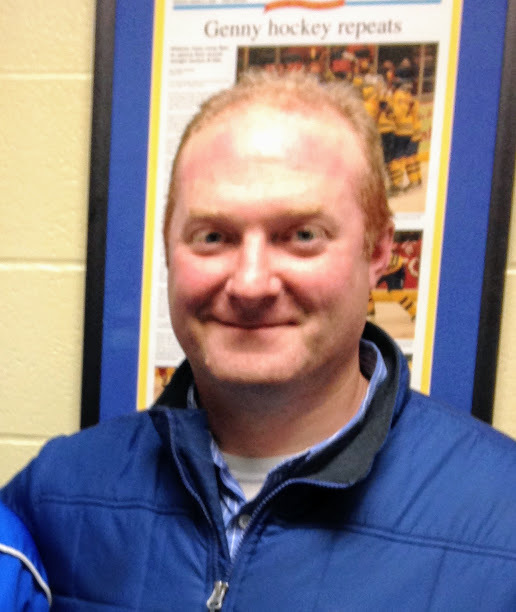 Eric Burns joined the Wildcat Hockey staff as an assistant coach in the 2015-16 season. He is an Assistant Coach for the Camillus U-14 team. He also coaches in the West Genesee Lacrosse Program. Burns developed the varsity lacrosse program at Onondaga Central School District, while serving as the Section III Class C League Representative. He was selected to the Brine National Lacrosse Classic coaching staff for Team Syracuse. A former West Genesee hockey player, Burns played for Coach Colabufo from 1994-1997. He brings valuable teaching and coaching experience to the staff. Burns teaches Social Studies at West Genesee High School. He earned a Bachelor’s Degree from Hobart College and a Masters Degree in Education from SUNY Cortland. He lives in the West Genesee School District with his wife, Megan, and three children, Liam, Gracie, and Delaney. 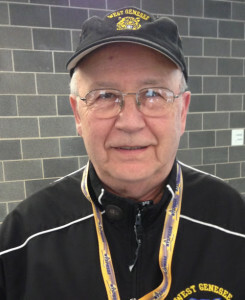 Tom Colabufo has been the videographer for the West Genesee Wildcats since the 2000-01 state championship season. He is retired from the Syracuse City School District after 35 years of service as a teacher, guidance counselor, building principal, and central office administrator. He has a Bachelors Degree from Le Moyne College and a Certificate of Advanced Studies from Syracuse University. His loyalty and commitment to the hockey program has been previously recognized, as he is a past recipient of the Sam Alfieri Award. Additionally, Colabufo is a fourth degree member of the Knights of Columbus and is the Eucharistic Adoration Coordinator for Holy Family Parish. Tom and his wife, Carmella, have four children, Frank, Teresa, Sam, and Tom. Dom Fruscello has served as the Voice of the Wildcats since the 2001-02 season. During his time with the program the team has won league, sectional, regional, and state titles. His loyalty and commitment to the hockey program has been previously recognized, as he is a past recipient of the Sam Alfieri Award. Dom and his wife, Karen, have one daughter, Maria.